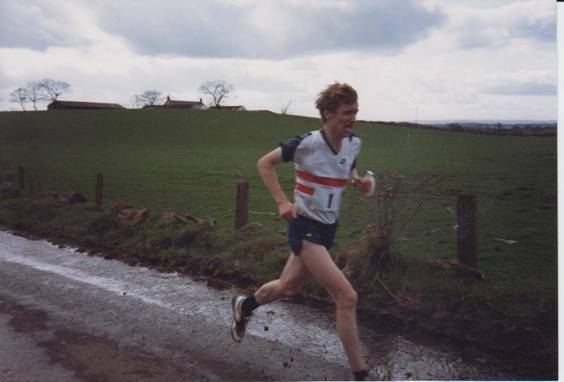 The Scottish Veteran Harriers Club (and in particular the irrepressible Danny Wilmoth) organised the Alloa to Bishopbriggs in late March between 1984 and 1991. The route changed in 1992 to Alloa to Twechar. In 1993 the event was taken onto traffic-free roads at Torrance. Eventually the SVHC relay became a six-stage affair which is now held in Strathclyde Park. However the original Alloa to Bishopbriggs (or to Twechar) was undoubtedly considered better than the comparatively tame six-stager. A to B was the Vet equivalent of the legendary Edinburgh to Glasgow Road Relay (which also featured 8-man teams). The E to G invited around 20 teams; but the A to B allowed free entry and could cater for up to 50! So many runners on narrower roads with closer traffic whizzing past! To participate in the Alloa to Bishopbriggs 8-Stage Road Relay was a real adventure: dramatic, scary, and (at the front) extremely competitive, yet probably more fun than the E to G, since there was less pressure to succeed. A wide age-range produced widely-varying speed and fitness. But what an experience for all! N.B. A minor miracle: absolutely no injuries were caused by motor vehicles! As can be seen the results above, big clubs from the West of Scotland dominated until a few from the East (or indeed North-East) began to make an impact. However once the race shifted to Torrance on closed roads, and then became only Six-Stage, Cambuslang regained superiority (although Metro Aberdeen R.C. came second a couple of times). I only have four results sheets. In 1988, the fastest stage times were set by: Ken (Archie) Duncan (Pitreavie; Jack Adair (Bellahouston); Brian Carty (Shettleston); Andy Stirling ((Falkirk); Eddie McIvor (Cambuslang); Willie Daly (Falkirk); Andy Hughes (Cambuslang); and A. Nixon (Gosforth Harriers). In 1989, the quickest men were: Brian Carty (Shettleston); Stuart Asher (Fife); Tony Ross (Fife); Ian Seggie (Livingston); Peter Marshall (Haddington); Ian Briggs (Livingston); Ian Leggett (Livingston); and Ian Stark (Springburn). The 1990 information sheet sets out the route from Alloa to Bishopbriggs. THE ROUTE: A907 out of Alloa, turn right onto A977, turn right on A88 across Kincardine Bridge, turn right onto A905, via Airth, Dunmore, turn left (South) on A91 Coupar-Stirling By-Pass, continue on the A872, turn right on the A803, via Kilsyth, Kirkintilloch, crossing to the West side of the road to the last changeover at Industrial Estate, Kirkintilloch, continue on the West side of the A803 and turn onto the Forth & Clyde Canal footway at the “Stables Inn” (next to the Glasgow Bridge), thence along the footway to the finish. Follow that (and signpost the junctions) if you can! The Alloa to Twechar route was as follows. The programme for this 1992 race added: “All runners must obey instructions regarding running on the correct side of road – otherwise their team will be disqualified.” But were you meant to run on the right, facing oncoming traffic, or on the left, in the direction that traffic was moving? Or did it vary? My own memory is of daring manoeuvres made in the heat of competitive zeal and flat-out effort. Maybe drivers simply avoided such obvious lunatics! At the end of Stage One, Graham Milne came in third; Jim Morrison, Francis Duguid, Ben Preece and Davie Grubb maintained our position; with the fastest time on the stage, I moved up to second; and then Ken Hogg and Rod McFarquhar finished a highly respectable third, less than a minute off victory. After the 1991 A-B, I wrote the following race report – and ‘poem’ for the club magazine! “Aberdeen Veterans had a golden day at this event. The First Team broke the course record by 16 minutes 1 second, beating Fife (last year’s winners) by more than five minutes. Our Second Team also broke the old record and finished seventh of the 42 teams entered. Every Aberdeen runner went well. Perhaps a particular hero was Bill Adams, who not only gave us an excellent start but also endured a tortuous and lengthy itinerary to get from Shetland to the race and home again in 36 hours. George Sim was speedy and stylish in breaking Fife hearts and also the Stage Six record (by 54 seconds). And Francis Duguid was the star on the same stage for the Second Team. A day to remember! (First Team was: Bill Adams, Colin Youngson, Charlie Noble, Eddie Butler, Dave Armitage, George Sim, Mel Edwards and Rod McFarquhar. was what we had to face. to third for his dear life. and wins medals of gold! behind at least, they say. once more our heroes led! he chopped the Stage Six record. then belted off like, well …..
And we achieved our goal. had won it by a mile! First Team were Scottish Champions! 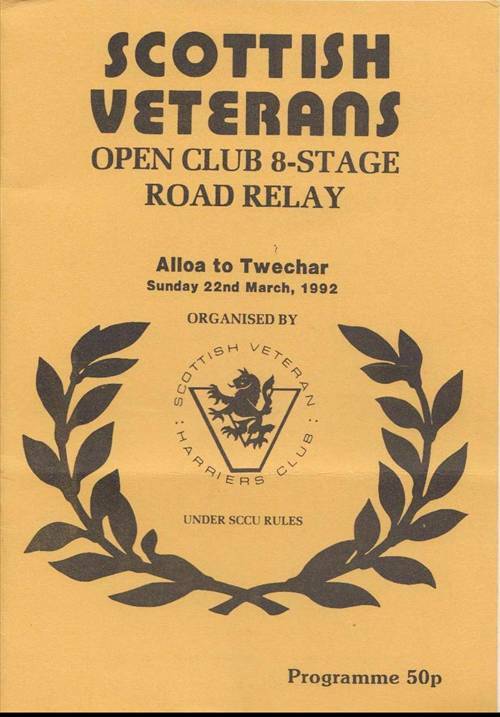 In 1992, the Alloa to Twechar was also an exciting contest between Fife and Aberdeen. The former held a narrow lead on Aberdeen for the first five legs. Then, on Stage Six, George Sim did it again, I extended the lead on the next leg and Francie Duguid brought us home 5.04 clear of Fife. There were two sets of the results. The second (correct?) version noted fastest stage times from: Charlie MacDougall (Calderglen), Cameron Spence (Spango), Tom Graham (Fife) and Graham Milne (equal), Tony Martin (Fife), Ian Burke (Bellahouston), Jim Dingwall (Falkirk), probably the best run of the day), me (only 13 seconds better than Falkirk’s Dougie McKenzie) and Bobby Young (Clydesdale). Our First Team was: Bill Adams, Eddie Butler, Graham Milne, Charlie Noble, Ben Preece, George Sim, Colin Youngson and Francis Duguid. The Second Team achieved a most meritorious sixth from 47 teams. They were: Chris Simpson, Ken Hogg, Davie Grubb, Ally McDonald, Kerr Walker, Ewen Rennie, John Ballantine and Mel Edwards. 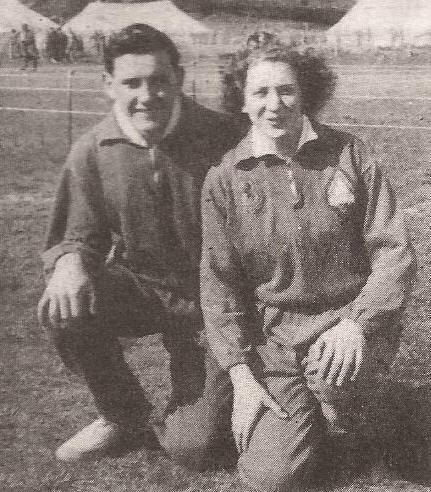 We reckoned that, if we had shifted a first team runner to the second team and vice versa, we might have finished first and second – but such brinkmanship had to be resisted, since it might also have left us second and third.